Something very exciting is happening in small scale opera. This is the third one I’ve seen in as many months, all striking in their own ways but Onegin is by far the most enjoyable. But then OperaUpClose are no Johnny-come-latelys. Founded in 2009, they’ve toured incessantly without ever dipping in terms of music or production quality –Eugene Onegin being no exception. Yet it’s only one of several productions making up their current touring repertoire. Once again, this Onegin stands out for its bold new approach. Onegin is usually a big, sumptuous affair with swirling ballroom scenes and dance ensembles. Director Lucy Bradley and OperaUpClose co-founder and librettist, Robin Norton-Hale have come up with an English version that sets it in 1960s suburban England. Tatyana is a bit of a book-worm, Olga her younger sister, out for a good-time. 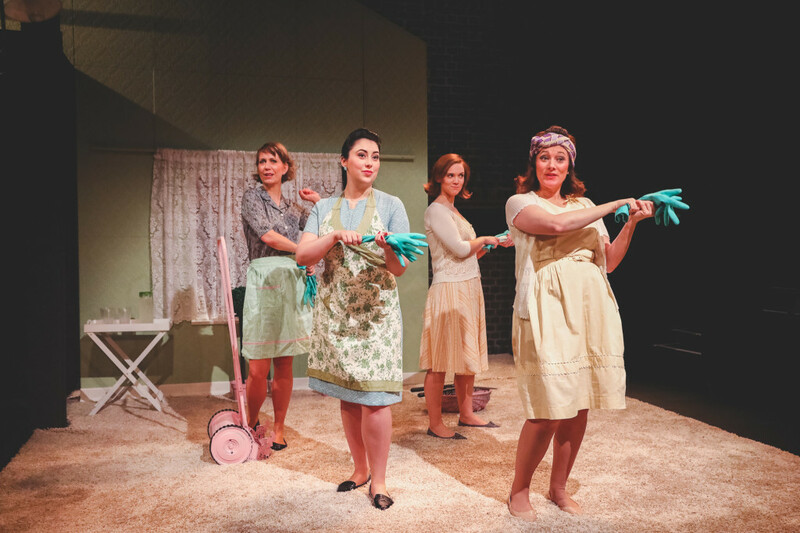 Their mother, Larina and her friends – domesticated creatures, wearing green washing up gloves – sing of how romantic dreams are soon overtaken in real married life by the chores of cleaning, washing and running around after children. © Andreas Grieger, Flora McIntosh as Filipyevna, Alexandra Stenson (Joyce), Caroline Daggett (Carol), Kathryn Hannah (Larina) – friends of Larina’s sing of their household chores..
All very zippy but it’s when Lensky – Olga’s boyfriend and his friend Onegin – break in that the story and Tchaikovsky’s opera, based on Pushkin’s original verse novel, really begins to hum. 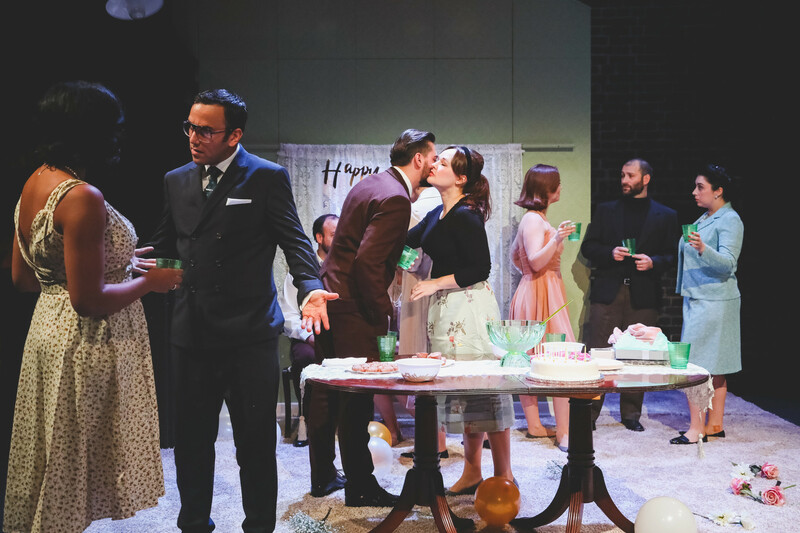 Part of OperaUpClose’s triumph with Eugene Onegin is its compactness. Whilst it can in no way compete with Stage Russia’s recent filmed version by Moscow’s Vahtangov in terms of epic disillusionment and thrilling visual spectacle, yet it establishes its own world with invention and intelligent placement. We begin to see- and hear – Tatyana’s increasing alienation from her family and the tragedy of her infatuation with Onegin. And the other crucial element to OperaUpClose’s success is the sheer quality of their young singers. They have two available for each leading role. On press night, it was Lucy Hall as Tatyana, Felix Kemp as Onegin and Anthony Flaum as Lensky. Hall revealed a simply stunning control and passionate dramatic skill, particularly in Tatyana’s famous letter-writing aria, carrying us at every moment through her emotional turbulence and finding herself so helplessly in love. As Onegin, Kemp cut a debonair though not especially dashing figure. I’d have liked to see a little more in Norton-Hale’s libretto exploring his aversion to conventional life. Here it’s left a little vague as to the heartless behaviour that not only rejects Tatyana’s earnest love but taunts his best friend, Lensky, to his ultimate limit. Anthony Flaum’s Lensky though is almost the production’s revelation. Clear and rich of tone from the first note, Flaum conveys the sincerity and romanticism of a character who, one might say, loves not wisely but too well. 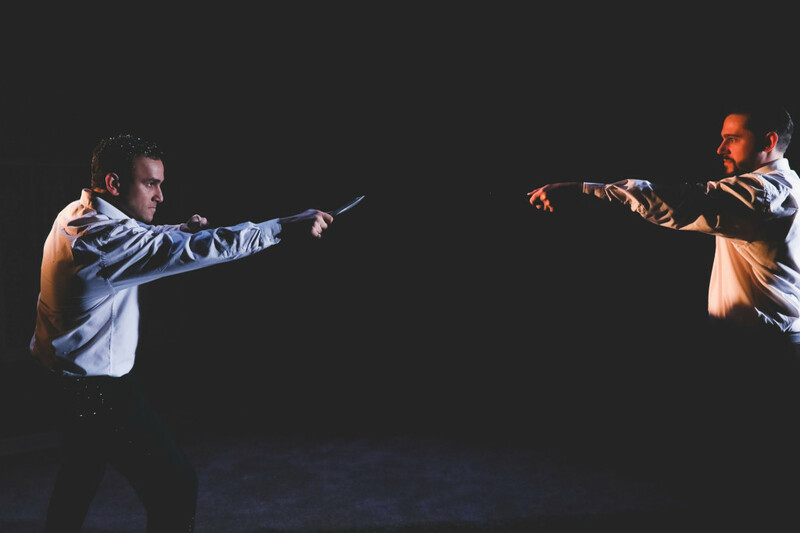 Goaded by his friend’s attentions to his girl-friend, Lensky challenges him to a duel. Flaum’s singing and Bradley’s staging of Lensky’s final scene before the duel, with the snow falling, is simply peerless: tragic, heartfelt, it does everything you’d hope for as Tchaikovsky’s music reaches its climax. It’s only at that moment too that one longs for a full orchestrated blast that Alison Holford’s chamber arrangement of piano and string quartet otherwise manages to perfectly adequately exchange for something quieter and more intimate befitting an opera concentrating on the more personal, inner feelings of his protagonists. © Andreas Grieger, Anthony Flaum as Lensky, before the duel. A revelation. This Onegin’s final scene is set at a London book launch where Tatyana has fulfilled her dream of becoming a successful author. And it is here, with Onegin’s plea to Tatyana to take him back, her declaration of continuing love for him but equally her determination to lead her own life, that Bradley and Tchaikovsky strike their own blow for female independence and autonomy away from the apron and kitchen strings. Hall and Kemp make this moment of dramatic denouement thrillingly heartbreakingly opera at its very finest: accessible, soaring, strangely uplifting and very Russian! 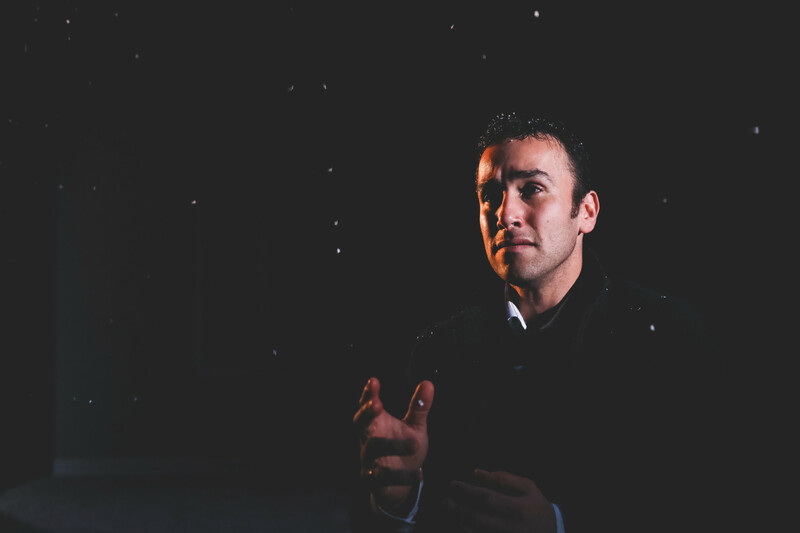 `Alone, unloved, who will absolve me?’ sings Onegin, a very Russian, very Dostoyevskian sentiment – redemption, absolution being as inimical to the Russian soul as pastoral lyricism to the English. What a wonderful piece. Congratulations to them. Long may OperaUpClose continue. And keep a watch out for Lucy Hall, Felix Kemp and especially Anthony Flaum. Opera stars in the making. For more tour dates, see OpersUpClose website. This entry was posted in 2017, Reviews and tagged Alison Holford, Anthony Flaum, Arcola Theatre, callous emotional cruelty, Felix Kemp, female autonomy, Lucy Bradley, Lucy Hall, OperaUpClose, Pushkin, Robin Norton-Hale, small scale opera, Tchaikovsky on November 30, 2017 by Carole Woddis.